Dramm offers a series of environmental control systems designed to aid the grower in creating the perfect greenhouse environment. From HAF fans that homogenize the temperature, humidity, and CO2 to rugged thermostats designed to take rough greenhouse conditions, Dramm offers solutions. Dramm also offers cooling products such as low pressure fog systems. The Dramm AME Horizontal Air Flow (HAF) Fans offer efficiency, flexibility, and simplicity. Utilizing an aerodynamic design and a high-efficiency motor, the AME fan is equipped to maximize the air flow potential of any situation. 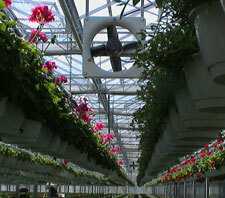 When combined with speed controllers, the AME Fans offer unmatched flexibility in air flow as plants grow and mature. Because of their shrouded, aerodynamic design and high-efficiency motor, Air Movement Efficiency (AME) fans cover greater distances with better, more even air speeds. The AME Fan design provides leverage for air movement. The result is not only increased forward propulsion but a pull from behind the fan as well. This helps to even air speeds by creating momentum throughout the house. The result is fewer fans needed and an increase in efficacy and reduction in electrical costs. The Dramm AME Horizontal Air Flow System performs best when sized to fit a particular situation. Dramm technical personnel take into account many different variables in each greenhouse before designing a customized layout. To have a layout prepared for your greenhouse please contact your Dramm Technical Representative. The AME fans and Controllers can be connected to an external climate control computer for automated speed regulation. For more information, please refer to this document. The Dramm AME Variable Power-Station is designed to provide precise control in a variety of applications. The analog Power-Station can be used for controlling variable-speed single-phase fans, electrical heating, bulb or tube lights, cooling systems or other electrical devices. The Power-Station regulates the voltage to the electronic device. When used with AME variable-speed fans, the Variable Power-Station controls the voltage supplied to the fan, varying the speed of the fan. The Variable Power-Station can be used as a manual controller or with other control systems. Additionally, the Power-Station is protected against extreme electrical fluctuations.The Power-Station is also provided with an alarm output that will trigger as a result of power failure, etc. and will automatically switch to the manual setting to keep fans running. 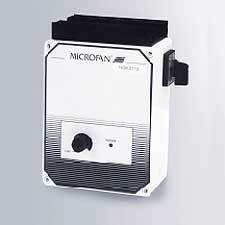 The Dramm Microfan mechanical thermostats are designed with rough environments in mind. 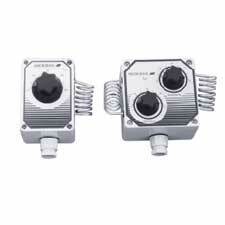 These high quality thermostats are perfect for any situation where harsh conditions may damage less durable equipment. Protected in sealed PVC housings, these thermostats offer stainless steel coiled sensors and accuracy to 1_ C. The SPDT (Single Pole Double Throw) switch contact (one set of contacts open on temperature rise as the other set closes) is a no load contact and offers superior accuracy. Designed to be placed in the area to be controlled, the Dramm Microfan Thermostats are perfect for heating, cooling, and ventilation control in greenhouses, factory buildings, warehouses, farms or anywhere requiring accuracy in control. Two different thermostats are available: the T41-SV Single-Stage and the T42-SV Double-Stage Thermostat. Both are CSA approved and available in Canada.